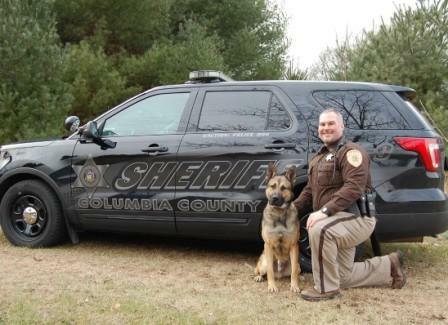 The Columbia County Sheriff's Office K9 Unit currently consists of Deputy Greg Kaschinske partnered with K9 Recon, Deputy Mike Schultz partnered with K9 Jax and Deputy Jordan Haueter partnered with K9 Mattis. They are assigned to the patrol division. The current K9 Unit started in 1995 with now retired K9 Ispi. 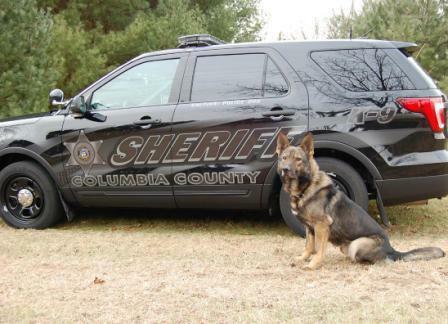 Typically dogs sought by the Columbia County Sheriff's Office are trained in drug detection, tracking, article searches, handler protection, criminal apprehension, building searches and area searches. All Columbia County Sheriff's Office K9 teams are required to go through monthly training in the above areas. The Columbia County Sheriff's Office dogs are certified through American Police Canine Association. The dogs' detection ability enables the handler to conduct thorough and complete searches with minimal time and personnel as well as increasing safety to officers. Each dog lives with its assigned handler. Throughout the year, this team is available to assist wherever needed anywhere in the county. The main value of the K9 Unit lies in the mere presence on the street. The psychological and deterring effect cannot be measured. This helps assist the Columbia County Sheriff's Office with its primary function of preserving life and property. Deputy Gregory Kaschinske was partnered with K9 Recon in 2017. Recon is a male German Shepherd born in 2012 overseas in Holland. K9 Recon is one of three active K9 teams for Columbia County Sheriff's Office. K9 Recon is a Dual-Purpose Police Dog. He is trained to find drugs, evidence/articles as well as conduct building and area searches for persons. K9 Recon is also trained to perform criminal apprehensions and tracking. K9 Jax joined the Columbia County Sheriff's Office K9 Unit in July 2017 and is partnered with Deputy Mike Schultz. K9 Jax is a German Shepherd mix and was born on 04/23/16 in the Czech Republic. Deputy Schultz and K9 Jax are certified for narcotics detention, to conduct tracking for lost or fleeing persons and article searches in open areas. K9 Jax's favorite toy is a tennis ball. 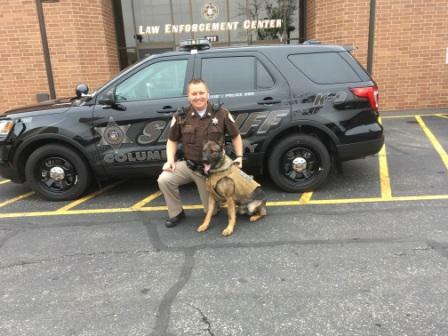 K9 Mattis is the newest member to the Columbia County Sheriff's Office K9 Unit in May 2018. Mattis is partnered with Deputy Jordan Haueter. Mattis is a male German Shepherd. He was born in the Czech Republic in November of 2015. His commands are given in Czech. He is a dual purpose patrol dog. He is trained in criminal apprehension, tracking, narcotics detention and article/evidence searches. Mattis' favorite toy is also a tennis ball. Lieutenant Brian Pulvermacher at (608) 742-4166 or email.